Inward cargo: 20 horses, a quantity of fodder, beans, paddy and wheat. Entire cargo transported to Canton. Repairs: Vessel is being repainted in a different colour. An image of this ship would be helpful. Wuhu Maru was built in 1942 and was 3222 gross tons. Her official number was 50250. The ship had indeed already been sunk by submarine attack on 29 October 1943 in 22.40N 116.10E and therefore could not have been a member of convoy No. 92 which left Takao 27 July and arrived Hong Kong 30 July 1944 and is known to have consisted of Sainan Maru and Tozan Maru (ex Soochow) – see these separate entries escorted by old destroyer Kuri and torpedo boat Hiyodori. 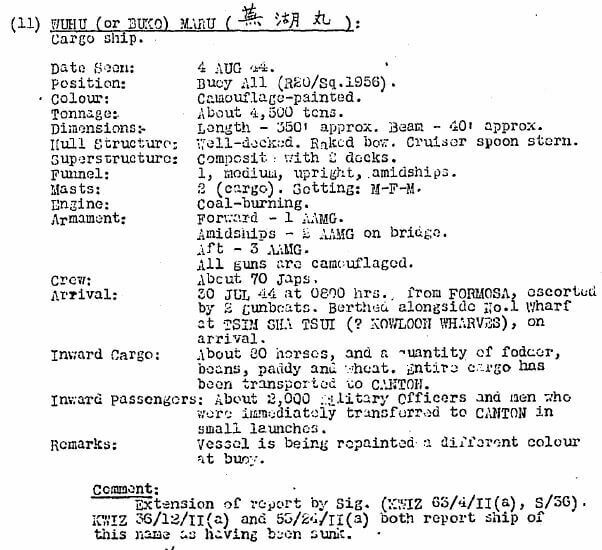 4/8/44 departed Kirun en route to Moji. 9/8/44 at 0407 in position 27.56N 128.47E about 18km WNW of Mt Amagi, Tokunoshima torpedoed and sunk. At the time loaded with sugar. .It seems unlikely the ship could have got to Kirun (Keelung) and loaded a cargo of sugar (a Formosan export) in time to depart 4 August. For this reason the identity of this ship is questionable. .